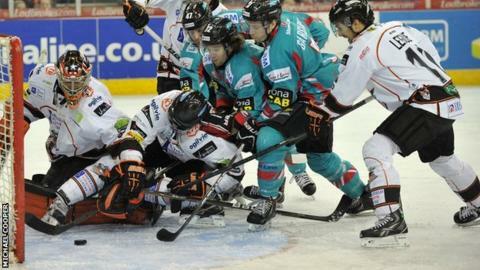 Belfast Giants closed the gap on Elite League leaders Nottingham to two points after beating Cardiff Devils in Wales. Cardiff scored twice in the opening two minutes through Max Birbraer and Josh Batch before Daryl Lloyd pulled one back on nine minutes. Goals from Chad Langlais, Robby Sandrock and Noah Clarke put the Giants in charge but Stuart MacRae struck for the hosts to make it 4-3. Langlais netted five minutes from time to secure the victory. Sunday's win completed a weekend double for Belfast after a 3-1 win over Sheffield Steelers at the Odyssey 24 hours earlier. Mark Garside, Adam Keefe and Lloyd were on target for the champions, who have played a game more than the pacesetting Panthers.